Whether it rains, snows, or even when there’s sunshine, the romance of driving a motorcar only gets amplified when you get behind the wheel of one in your favourite weather. It somehow is therapeutic when the mercury sets itself to your favourite degree or Fahrenheit, you’ve got keys to wheels you love and your fingers somehow skip to a track, the sound of which makes you feel the world isn’t a bad place after all. 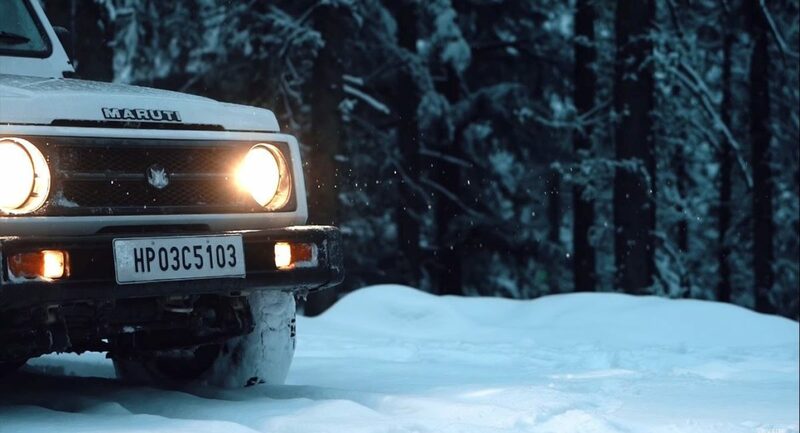 Watching this Maruti Gypsy drive through snow is somewhat similar. Being driven around the hilly town of Jubbal in Himachal Pradesh, the visuals from the camera mounted near the Gypsy’s windscreen will transport you into a different world. There is something about the fresh snow being wiped off the glass, the powder deposit on the pine trees and on everything else around. The footage captures the simplicity of time and speed of life in that area too, which many mostly daydream about behind our desks while we plan for retirement. The Gypsy? Its last example is probably being rolled off the production line as you read this. Maruti had stopped taking new orders for the vehicle last year, as the mountain goat couldn’t have made it past the upcoming safety norms. There is no certainty if the new Jimny will go on sale here, but we know a lot of them out there who would form a queue outside the dealership to buy one if it happens tomorrow. Until then, there’s the Thar which is a capable alternative too and will soon be replaced by a new-generation example which will be bigger, wider and will be powered by a more modern, and efficient engine. Watch the video, should give you ideas on the last working day of the week.